Veggie Style Protein Moringa Oleifera Powder Capsules contains a range of vitamins, minerals, essential fatty acids, antioxidants and all essential amino acids, according to the manufacturer. It claims this supplement boosts nutrition and overall health, while encouraging weight loss and giving you extra energy. These vegetarian capsules contain 400mg of 100% organic Moringa Oleifera leaf in powder form. Veggie Syle recommends taking 2-4 capsules per day, but does not specify when these should be taken, and whether they should be accompanied by a meal or glass of water. Moringa should not be taken by pregnant women. The supplement has been shown to increase the production of breast milk, but the effects on children have not been studied. It also has an anticoagulant effect, which may be harmful for those with blood disorders, so it is important to consult a healthcare professional before taking. It is important not to exceed the recommended dosage of this product, as it can cause harmful effects if taken in excess over time. Through the Veggie Style website 100-capsule bottle was available for $17.15 at the time of writing. There was no subscription service offered or promotional pricing but free shipping was offered on orders over $42.00. The company offers as 100% satisfaction guarantee, but this seems to be based on customer service, rather than money-back for a product that is returned. They advertise fast communication across multiple platforms to provide assistance but it is unclear if they will assist in returning a product. There are no available reviews of this product on the company’s site or others, so it is unclear what users’ satisfaction level is. Moringa Oleifera leaf has been shown to have numerous health benefits, and this 100% organic formula is suitable for vegetarians and vegans, which is especially helpful because of the protein content of Moringa. The price is competitive, but a limited product guarantee and no user reviews provide no information about the efficacy of the product or user satisfaction, giving us cause to recommend looking at competitors’ offerings. 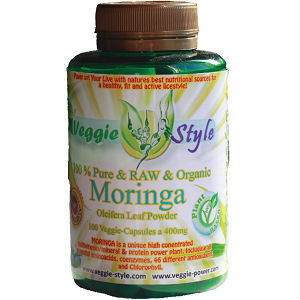 Michael Hall	reviewed Veggie Style Protein Moringa Oleifera	on May 17th	 and gave it a rating of 3.